The Marvel Cinematic Universe is a pure force of nature (even if it is comprised of mostly CGI). Since 2008, Marvel has gathered a colossal and dedicated fanbase that stretches right across the world. Avengers Infinity War took everyone on an emotional roller coaster, the follow up to that film looks to do exactly the same but on an even bigger scale. Why Has The Avengers: End Game Marketing Been So Effective? The ending of Infinity War left audiences shell shocked. A true cliffhanger has had millions of people speculating, theorising and predicting how the next instalment is going to follow it. The marketing of Avengers: Infinity War was epic in many ways. Trailers showed huge action set pieces, new characters coming together and brand new settings never seen before. 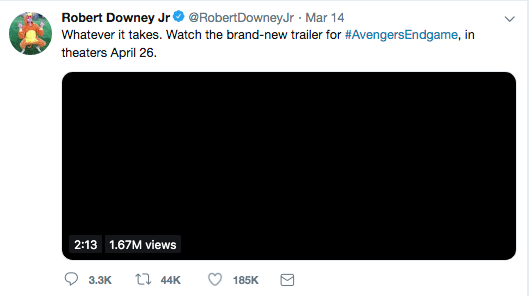 While this built a huge amount of hype, and saw Infinity War make a whopping $2 billion, there were certain fans who thought the trailers showed too much. It’s a common issue among moviegoers today. Studios will aim to sell tickets by showing epic set pieces in marketing materials but in doing so, it spoils the natural surprise fans would have got if they hadn’t been exposed to it. This is where Marvel has excelled with Avengers: Endgame marketing. Here’s our breakdown of how Marvel has used different platforms and strategies to build even more hype around the film. So far, there has been around three trailers released for Endgame. However, pretty much all the trailers have only shown the first 20 minutes of the film. This is a smart move for many reasons. Not only does it protect fans from spoilers, it also leaves audiences eager to buy tickets to the film out of sheer curiosity. Focusing on story and character development in the trailers, instead of spoiling the action, only builds even more anticipation. Going into a film and not knowing how it's going to pan out, or what scenes are going to be shown, is very rare these days. Showing very little story and action sequences also encourages audiences to speculate how the film is going to turn out. This leads to masses of people producing speculative content for sites like YouTube, indirectly marketing the film from a user generation point of view. One YouTuber in particular, Deffinition, gives a breakdown of the first, second and third Endgame trailer, connecting the dots that others may have missed. The trailer’s have done a great job at evoking nostalgic feelings within audiences by scattering them with clips from previous films. In the second trailer, we get shots from the first Iron Man through to the first Captain America, this takes people down memory lane and highlights where this journey started. The throwbacks to previous films works perfectly for Endgame since it is the final chapter in the Marvel Cinematic Universe. Adding the older films to the trailers really builds background context to the events whilst also showing how far the individual characters have come. As well as promoting the actual film, the Endgame trailer also effectively promotes the movie that has come before it: Captain Marvel. Captain Marvel receives the spotlight in the second trailer through her interaction with Chris Hemsworth’s Thor. As Captain Marvel is still showing in the cinemas, this is a clever move by Marvel as it gives people a reason to go and watch the movie so they are prepared for her appearance in Endgame. With 32.5 million followers on Instagram, Marvel has a well established platform to publish content on. 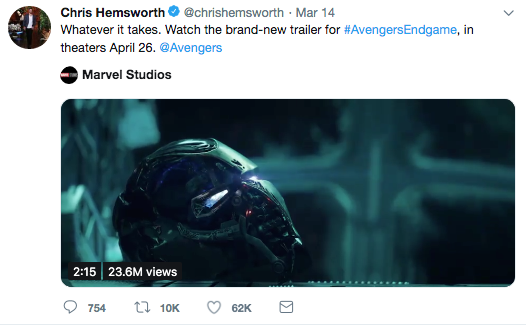 They have catered their marketing materials specifically to individual channels, for example, using condensed snippets of their trailers on Instagram with a link to the full trailer on YouTube. 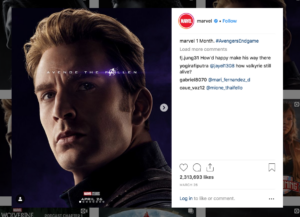 Marvel has also stayed consistent with the #AvengersEndgame hashtag being used on Twitter, Instagram and Facebook. Many iterations of poster designs for the movie can be seen on Marvel’s Instagram, Twitter and Facebook too. The stylish poster designs work perfectly on social media to engage fans and visually showcase the actors/characters in the films. After the infamous “snap” from Thanos, we saw half the marvel universe dusted. That big purple b*stard. 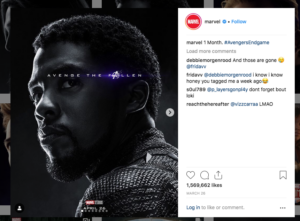 To capitalise on the audiences bereavement, Marvel has produced a series of images for social media juxtaposing the characters who survived with the ones who were sadly snapped out of existence (The trauma is still very real). A very simple idea but one that builds up anticipation as to whether the dusted characters will return or not and drives huge engagement. Not only have marvel done a fantastic job at filling our feeds with superhero goodness, the actors and directors from Endgame have also done a great job at promoting the film. 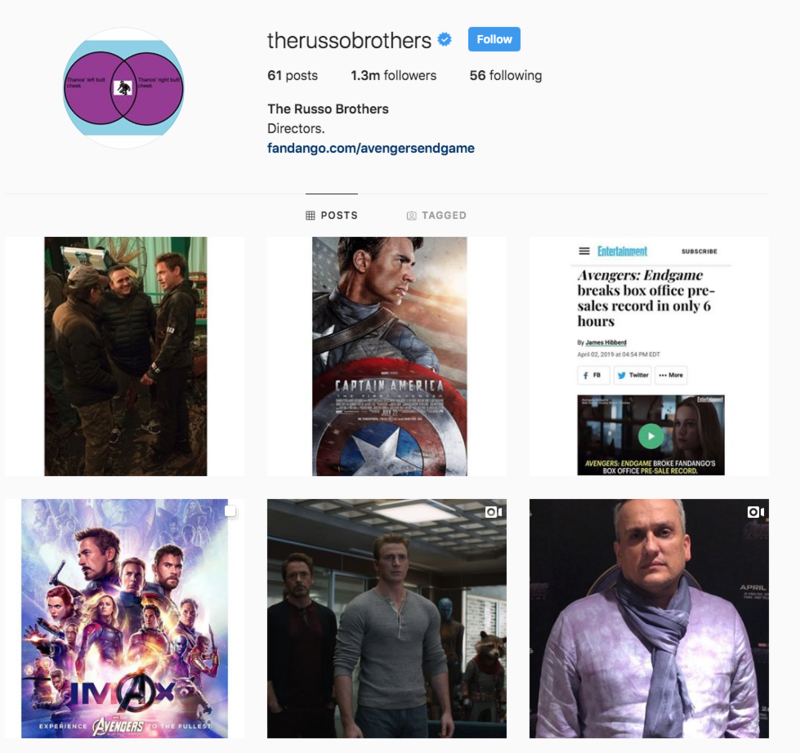 The Russo Brothers, who have directed Infinity War and Endgame, have populated their social media feeds with relevant marketing materials from the film, as well as behind the scenes images. It shows how much the directors care about their creation and how proud they are to see their ideas come to fruition. As a fan, its encouraging to see directors so passionate about their work and gives people more reason to care about this movie. This leads us to our next point: The casts social media. Endgame is filled with some huge stars. From Chris Hemsworth and Robert Downy Jr to Bradley Cooper and Scarlett Johansson. 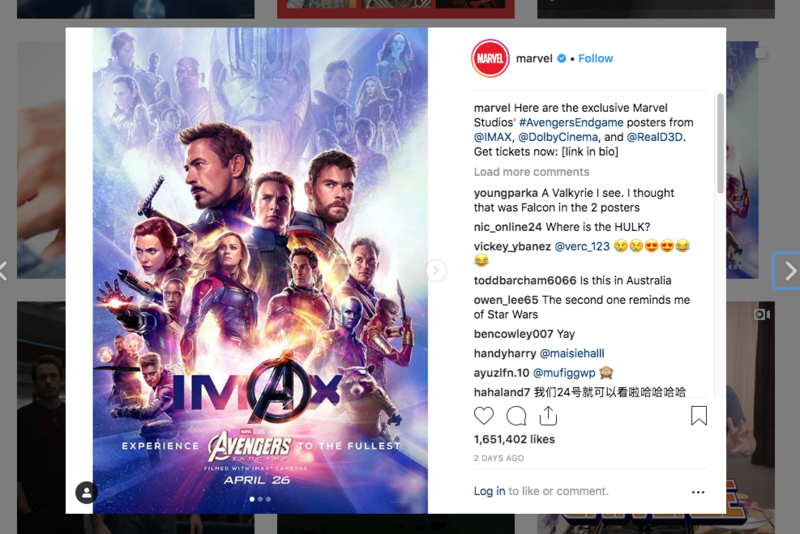 The 5 main stars of the Avengers have a collective audience of around 35 million on Twitter and 50 Million on Instagram. 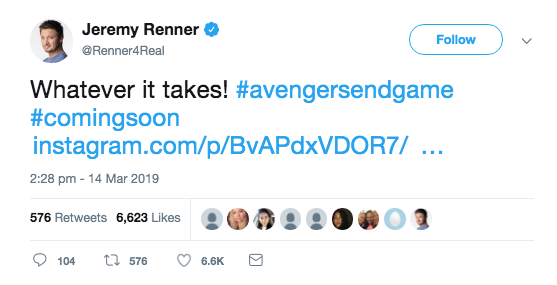 This gives Marvel the ability to leverage their actor’s social media platforms to again build anticipation for the film and drive ticket sales. 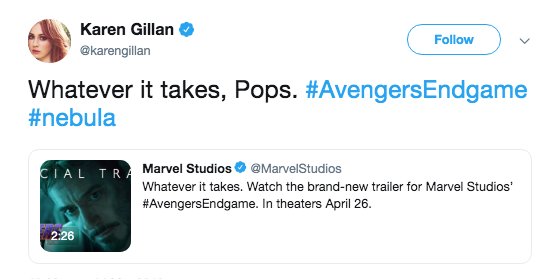 A great example of the actors getting involved was tweeting the recurring line from the trailers: “Whatever it takes”. The constant repetition of this line sticks in peoples heads and really drives home the message that this is a film where the stakes are incredibly high. Endgame is hopefully going to rock the world and provide fans with a satisfying conclusion to the epic adventure that Iron Man started us on. The way Marvel has marketed the film so far has been refreshing, especially in a world that contains so many spoiler ridden trailers. Marvel has used mystery, curiosity and leveraged their own stars platform’s to generate a buzz. And boy, has it worked. 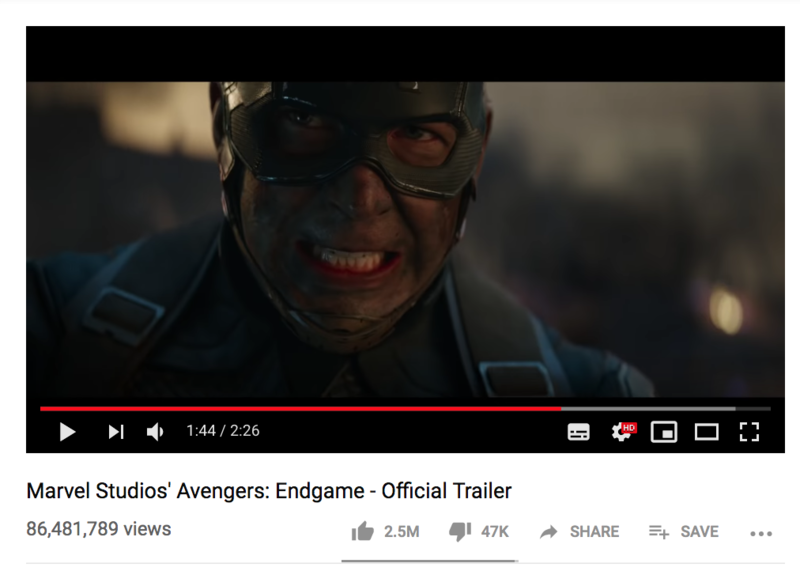 Endgame has just smashed records for their pre-sale tickets, which means only one thing: April 26th is going to be a hell of a day.